I find most freeware games to be temporary distractions, but every once in a while I get hooked on one longer than usual. Such is the case with Mystic Balloon. 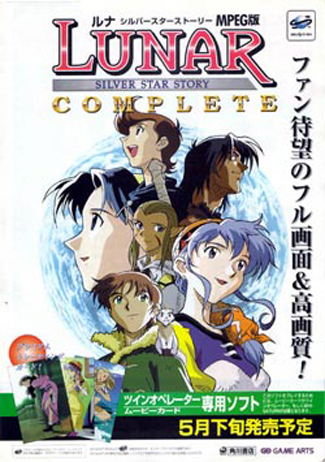 Originally a cooperation between two Japanese developers, this puzzle game was translated a few days ago by Derrick Sobodash. Mystic Balloon’s plot is simple, as are both music and graphics. But the puzzles are rightfully the heart of the game, and there are a lot of them. Our forecast for tomorrow is mostly cloudy with a chance of ice and springs. 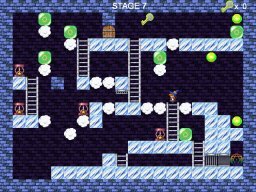 In this puzzle game, you make your way through individual 2-dimensional puzzle map-areas – similar to Lolo – but in Mystic Ballon, gravity has an effect and there aren’t enemies – the game is pure puzzle, and controls are tight so mistakes are the player’s fault. Objects found in the game range from springs and blocks to clouds, ladders, keys, ice… and I’ve just touched the surface. The only movements available to the player are jumping and picking up objects, but the objects offer the diversity necessary to keep puzzles interesting and varied. There are 50 puzzles in the main game mode. The first few are simple and designed to show off a new type of block or object. They get progressively more difficult and thus more frustrating, but so far the game looks like it will give me puzzle-based enjoyment for a while. Along with the main 50 puzzles, there are a few unlockable extra levels. A stage designer is also included, and a couple hundred puzzles are available for download on the original developer’s website. Mr. Sobodash has set up an English database on his own site for more puzzles, too, so those particularly interested in games of this genre have enough resources available to keep playing for a long time – and can also submit their own puzzles for others to download. If you like playing puzzle games, give Mystic Balloon a shot. If you’re not sure whether you’ll enjoy it, I still recommend giving it a try. After all, it’s free thanks to the makers and translator!